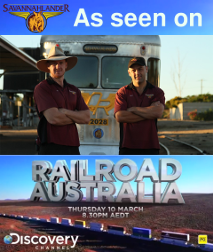 Take in the best that outback railways in North Queensland have to offer with a trip on BOTH the iconic Gulflander and Savannahlander trains over a 5 day, 4 night package. This tour package includes your rail fare, accommodation, dinners, breakfasts and all the side-tours and transfers during your visit to the outback that takes in our historic rail journey through the wet tropics and savannah country, Cobbold Gorge and the Undara Lava Tubes. Tuesday: Get yourself to Normanton by Tuesday travelling by car, foot, camel train, wheelbarrow or fly in from Cairns or Mt Isa. Your accommodation, dinner and breakfast the next morning is included in this tour package. Wednesday: Take the Gulflander from Normanton to Croydon and stay there the night. Saturday: Travel on the Savannahlander on it’s journey home from Mt Surprise to Cairns. Please click this link for a detailed itinerary of the Gulflander and Savannahlander 6 day tour via Croydon. Get yourself to Normanton by Tuesday travelling by car, foot, camel train, wheelbarrow or fly in from Cairns or Mt Isa. Spend the night in Normanton as part of our tour including dinner and breakfast the next morning and catch Wednesday’s Gulflander to Croydon and enjoy a morning tea along the way. When you arrive in Croydon it’s a short walk of a few hundred meters to your accommodation for the evening at either the Croydon Club Hotel or the Croydon Caravan Park. Meals are provided at the Croydon Club hotel and you will have the chance to explore the town at your leisure in the afternoon. Thursday morning you will be picked up from the veranda of the Croydon Club Hotel and enjoy a coach transfer to Mt Surprise. After a quick lunch at Mt Surprise you will board the Savannahlander for it’s outbound journey to Forsayth with a stop at the historic town of Einasleigh. Depending on your accommodation (either Cobbold Gorge or Forsayth depending on availability) you will either stay in Forsayth and depart for Cobbold Gorge on Friday morning or you will depart Thursday evening around 6pm and transfer to Cobbold Gorge. In either case you will be able to enjoy an amazing tour up Cobbold Gorge on their custom made electric boats. After your tour you will transfer to Einasleigh for lunch and board the Savannahlander for it’s journey to Mt Surprise. If you have chosen the option to stay at the Undara Lava Lodge you will transfer there immediately. Otherwise you will disembark and after a brief stop to your rooms you will enjoy a guided tour of the Undara Lava Tubes and return to Mt Surprise in time for dinner. Saturday morning sees you up bright and early for a full day on the Savannahlander as it makes it way from Mt Surprise back to Cairns winding through the outback as it transitions from the outback savannah country to the agricultural regions around Mareeba and down through the wet tropics as you approach your destination. Travel on the Gulflander from Normanton to Croydon. Travel on the Savannahlander from Forsayth to Cairns. En-suite accommodation in Normanton, Forsayth and Mt Surprise. Transfers from Croydon to Forsayth. Remove the Tour of Cobbold Gorge – enjoy your night in Forsayth and your morning’s journey on the Savannahlander to Einasleigh. Include a Tour and Stay at Undara Expereince – Stay at the Undara Lava Lodge and tour the tubes. Your accommodation will be in the restored and ensuited Railway Carriages by preference, or in the wonderful Pioneer Huts (also ensuited) if the carriages are unavailable. You will also have dinner and a Bush Breakfast in the morning and then return to Mt Surprise for the train on Saturday Morning.